Academic excellence is achieved through a rigorous, inspiring and broad curriculum which engenders a love of learning in our girls. The core subjects of English, Maths, Science and Computing are enhanced by studies in Spanish, Latin, Thinking Skills, History, Geography, PE, Swimming, Music, Art, Design Technology, Religious Studies, Drama and PSHE. 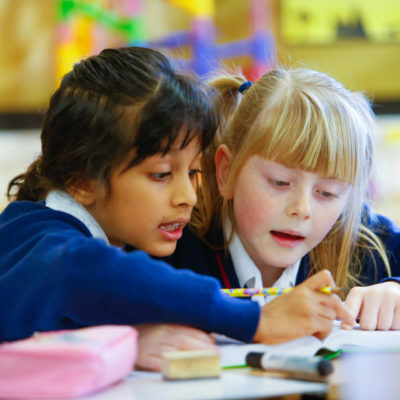 Intellectual curiosity and in-depth learning are encouraged through research, general knowledge homework, open-ended investigations and collaborative learning activities. The curriculum is rich, stimulating, varied and challenging, enabling girls to develop their skills and passions. STEM lessons for the older pupils in Junior School involve projects that link Science, Technology, Engineering and Maths. Computing lessons include coding skills from Year 1 upwards in the Junior School dedicated ICT Suite. English lessons incorporate engaging and imaginative novels, poetry and non- fiction texts to enable girls to develop their reading and writing skills and to inspire a life- long love of reading. All Junior School girls have weekly library lessons in our extensively stocked Junior libraries. Termly assessments in English, Maths and Science from Year 1 upwards feed into target setting and enable staff to tailor the curriculum to individual pupils to enhance pupil progress and ensure all pupils are challenged. Assessment results and targets are shared with parents. Challenge tasks are incorporated across the curriculum to stretch girls. With a dedicated Form Teacher and Teaching Assistant in each class, Years 1 and 2 are based in Vincent House, where bright and colourful classrooms are decorated with displays to reflect current topics. Years 3 – 6 are based in Bryden Brown House, a modern, purpose-built building where the girls benefit from a more formal approach to learning. We are delighted with the way that our daughter has settled in and developed in her first year at ‘big school’. Our Junior School is equipped with specialist teaching facilities for Computing, Art and Technology, Science, a dedicated multi-purpose School Hall which is used for assemblies, Drama and PE. Specialist coaching and teaching in Sport and Music are available to all, not just to the sporting or musical ‘elite’. Our Sports Complex features a 25 metre indoor swimming pool, large indoor sports hall, a seven-metre-high climbing wall, netball and tennis courts, all-weather pitches, sports field, dance studio and fitness suite. Musical and Dramatic Art plays a key role at Northwood College for Girls, with girls of all ages participating in drama and musical productions, clubs, concerts and assemblies. Leading instrumentalists teach lessons in instruments ranging from the flute to the oboe, trombone to electric guitar and cello to steel pans. Girls can participate in musical performance groups including Orchestra, String Group, Junior School Choir and our competition choir, Songbirds. Our state of the art Performing Arts Centre offers a Music Technology Suite, Orchestra and Choir Recital Hall, ten practice/ensemble rehearsal rooms, a professional recording studio and spacious teaching classrooms. We are proud of our well- established and unique Thinking Skills programme that was originally pioneered in the Junior School to develop and enhance our pupils’ ability to be logical, critical and creative thinkers. Weekly Thinking Skills lessons focus on a wide range of skills such as decision making, lateral thinking, mind-mapping and the use of Edward de Bono’s Six Thinking Hats tool. These skills are also integrated across the curriculum. The girls are encouraged to gain a deeper understanding of their own preferred learning styles and to gain familiarity with a range of study and revision strategies. The programme also develops girls’ ability to think philosophically through Philosophy for Children sessions. Habits of mind which are linked to Thinking Skills, such as curiosity, resilience, resourcefulness, persistence and tenacity are encouraged across the curriculum. These habits of mind can play a significant role in a child’s academic success and personal happiness. Creative thinking is showcased and celebrated through events such as our Invent competition. 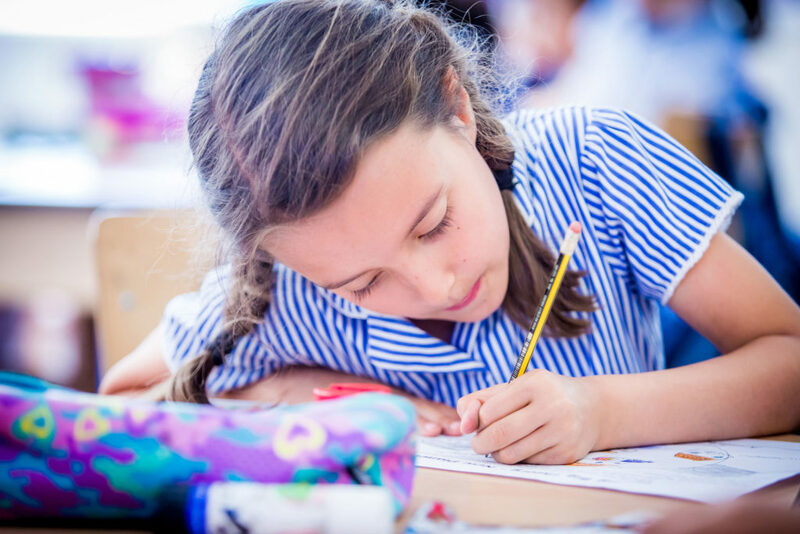 Being a member of the GDST means that our Junior School girls have the opportunity to participate in a wide range of national competitions, to strive for awards and prizes, as well as benefitting from a plethora of GDST learning initiatives, training, seminars and workshops. When our girls have progressed through the Junior School, they are automatically guaranteed a place in our highly academic Senior School. ‘More Able and Talented’ pupils is the new term used nationally for ‘Gifted and Talented’ pupils. In the Junior School, these pupils are identified according to teacher nominations and assessment data. The register of names is distributed to all members of staff. Tasks with significant stretch and challenge are then delivered across the curriculum to meet the needs of our ‘More Able and Talented’ students in every lesson. There are also lunch time and after school clubs designed to challenge and inspire our ‘More Able and Talented’ pupils.